I take careful consideration with all of my breedings to pick the right male for my female. I look for confirmation, temerament & health, with all being equally important. 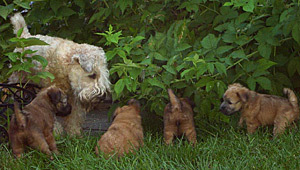 My first "Haldane" litter was born on May 10th of 2006. Ari had one puppy "Lucy", she was the darling of our house for 10 weeks then went to her forever home and is the princess of her palace. The second litter born to "Shelby" (she lives with a family just a few houses from me) on September 1st of 2006 consisted of 5 girls and 2 boys all of which are happily in their forever homes except for "Abby" who resides with me. The third litter born on December 15th of 2006 to Ari consisted of 7 girls and 1 boy. I have such a fun time with puppies. It is just amazing to watch the little squeakers grow and turn into little individuals in such a short amount of time. There is just nothing like "PUPPY BREATH". Ari's recent litter will be available for adoption soon. 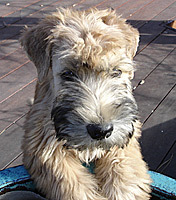 If you are interested in having a wheaten in your family, please complete and submit our online puppy application. 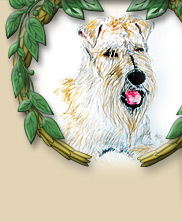 I will review your application and contact you about the possibility of getting one of the beautiful puppies. Click here to submit our Puppy Application.